Order two boxes of 50 and save! Stock up on FreeStyle Flash Diabetic Test Strips to test blood glucose levels with the FreeStyle Blood Glucose Monitoring System. The easy-to-use FreeStyle Test Strips allow people with diabetes to take a blood sample from multiple sites including their fingertips, forearm, upper arm, thigh, calf and fleshy part of the hand, eliminating virtually all the pain of testing. The package of FreeStyle Diabetic Test Strips comes in 1 vial of 100 TheraSense Test Strips. 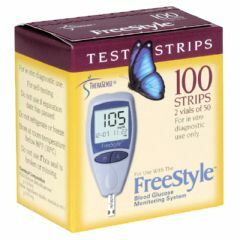 FreeStyle Flash Test Strips are affordable and easy to use! My insurance doesn't cover a sufficient quanity for me to test like I should. The price helped me provide myself the proper testing schedule to control my diabetes. new shown but old shipped. Reliable. Easy To Use. Accurate. Compact. Painless. I use the Freesyle. Not only does it use much blood, but smaller lancets are available. There an additional bonus to this brand. My favorite part is that the kit contained a FreeStyle Lancing Device with 5 settings which adjusts the depth of the lance. Generally, I set mine on a setting of 1, for a no-pain lancet. :-))Cool! Accurate. Reliable. Easy To Use. Compact. Painless. I THOUGHT IT WAS GREAT FOR THE PRICE! Painless. Easy To Use. Compact. Accurate. Reliable. IT WORKS WHEN YOU NEED IT. Do you accept Medicare assignment? How much do you charge the patient for test strips? do you handle Freestyle Insulinx testing strips? Do you have a phone number to call.